The word “Transitus” means crossing, going over, passage. Wednesday, October 3, 2018, marks the vigil of St. Francis of Assisi’s death and his birth into eternal life. Our Franciscan brothers invite you to join with them in the Old Mission Church as they celebrate this beautiful feast. Francis wasn’t afraid of death. He named her “Sister Death” and met the Lord with joy and peace. 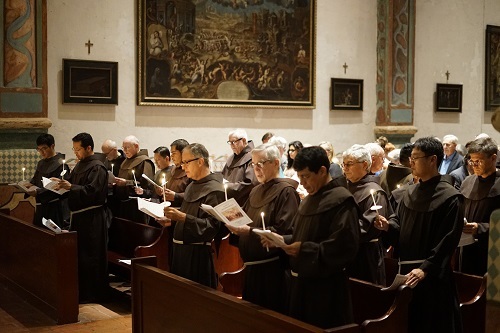 The brothers and sisters who were left behind and all Franciscans who have followed the Poor Man of Assisi treasure this perfect lesson – meeting God with gratitude and song. There will be readings, music, and a treat to share afterwards in the Historic Mission Gardens. One of Francis’ followers was a noblewoman, Blessed Jacqueline de Settesoli (1190-1273). One of his closest companions, he named her “Brother Jacoba” so that her presence wouldn’t cause scandal. “Brother Jacoba” brought his favorite treat, almond cookies, to his deathbed. On this night, all Franciscans will savor a taste of the kindness of Lady Settesoli to her friend Francis of Assisi.